Impedes the growth of malignant cells. Our dietary supplement is formulated from bromelain, a mixture of enzymes which have been used therapeutically since 1957. The subject of extensive study, these enzymes are extracted from the stem or roots of the pineapple, Ananas comosus. Bromelain gets its name from the Bromeliaceae or Bromeliad family to which the pineapple belongs. Bromelain is defined as a combination of proteolytic enzymes, molecules also known as peptidases or proteases. 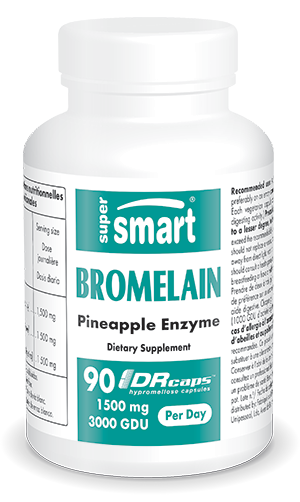 Like all proteolytic enzymes, bromelain is able to break down proteins. However, its highly specific action distinguishes it from other proteolytic enzymes such as papain and trypsin. In fact, bromelain is considered to be part of the family of cysteine proteases, which means it has the specific characteristic of cleaving the peptide bonds of proteins where the amino acid cysteine is found. Bromelain may have a beneficial effect on the digestive system. It is gastro-resistant and acts at different pH levels, making it effective in both the stomach and intestine. It works by cleaving the animal- or plant-source proteins we consume, and so facilitates digestion. As a result, it can reduce digestive problems and improve symptoms such as pain, bloating and flatulence. In addition to aiding digestion, bromelain also has other roles within the body. It is believed to counteract platelet aggregation, potentially helping to prevent thrombus - or blood clot - formation. Anti-platelet products are used widely to prevent vascular and cardiovascular diseases. In addition to its preventive action, bromelain also has a fibrinolytic effect – it also helps dissolve blood clots. Alongside bromelain’s anti-platelet effects are anti-inflammatory properties. A number of studies have shown that proteolytic enzymes may enable the activation of anti-inflammatory prostaglandins and inhibit bradykinin, a substance known to increase vascular permeability and stimulate pain. Hence bromelain’s use in the treatment of trauma injuries, particularly for post-trauma and post-operative inflammation. According to scientists, its administration is associated with decreased pain and improved wound-healing. In certain cases, bromelain can also be used as a natural anti-inflammatory for joint pain. More recently, scientists have been evaluating the effects of proteolytic enzymes on cancer cells. They have observed encouraging results from bromelain, in the form of anti-tumoural and anti-metastatic activity. Proteolytic enzymes may also help reduce some of the unwelcome side-effects of anti-cancer treatments. While these initial findings require confirmation, proteolytic enzymes offer new promise in the treatment of certain cancers. Our dietary supplement Bromelain 500mg is available in the form of vegetarian capsules at a suggested daily dose of 1000-1500mg - 2-3 capsules a day. This dose can be adapted to your needs and the advice of your therapist. Regardless, it is not recommended for individuals with a pineapple allergy, or to a lesser degree, for those allergic to bee venom or olive tree pollen. Other ingredients:Acacia gum, rice flour. Each vegetarian capsule contains 500 mg bromelain. Take two to three vegetarian capsules a day, or as advised by your therapist, preferably on an empty stomach unless taken as a digestive aid.